Below is the 2018 season recap for the Chicago Bears. First-year head coach Matt Nagy completely turned around the Bears and quarterback Mitchell Trubisky, leading them to a 12-4 record and the NFC North crown. The investment in Allen Robinson paid off to the tune of 13 games and the Bears’ highest overall grade on offense. 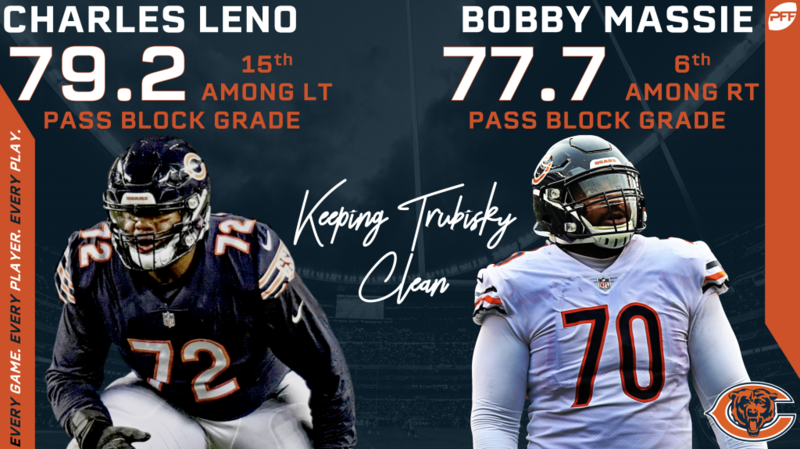 Bookend tackle play of Charles Leno and Bobby Massie were key to keeping Trubisky clean. Eddie Jackson, our coverage defender of the year, put forth the highest coverage grade of any secondary member in the NFL. Tarik Cohen was a weapon out of the backfield and finished with the fifth-highest receiving grade among running backs. Khalil Mack was worth every penny. He had 68 total pressures on 468 pass-rushes, freeing up Akiem Hicks to bring down 51 total pressures from the interior. Mitchell Trubisky struggled to push the ball down the field consistently. He had the lowest grade of any quarterback on throws targeted 10-plus yards down the field. 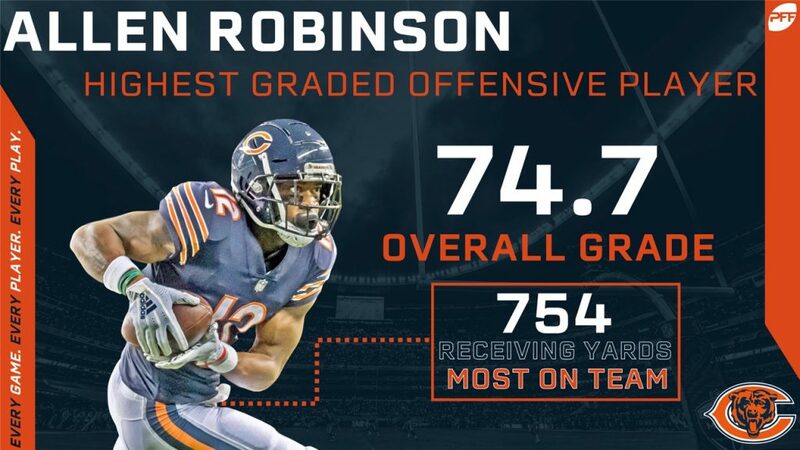 Robinson looked back from his ACL injury and put up 754 yards in thirteen games as he was the Bears’ leading receiver on the year. Jackson led all safeties with eight pass breakups and also led all safeties with six interceptions in a superb season. 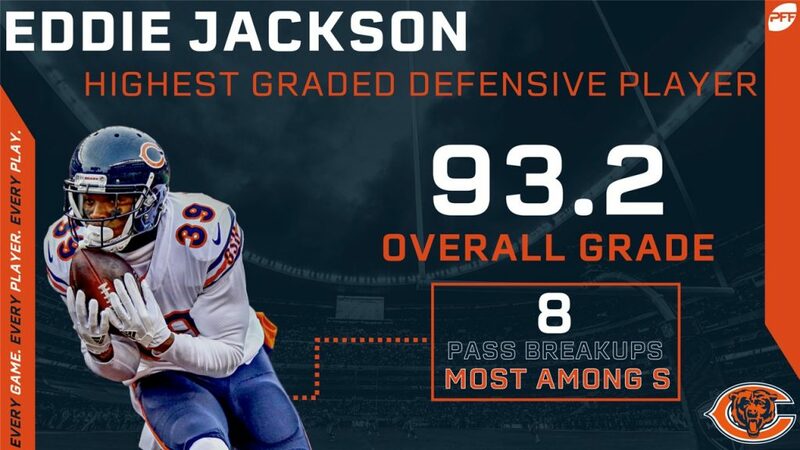 It’s difficult to break out too much more than Jackson who went from a fringe starter as a rookie to PFF’s coverage player of the year this season. The fifth-round pick out of Delaware outperformed his draft slot as he racked up 11 run stops on 130 snaps against the run. The Bears are one of the most complete rosters in the league and should be battling for the NFC North title for a long time.